The work of an equine veterinary nurse is necessarily more of a specialist job, compared to that of a small animal veterinary nurse. They deal with all aspects of horse care and the related veterinary procedures. The minimum age to start training at an approved equine training practice is 17 years.To be considered for training, candidates need 5 GCSEs at Grade C or above and subjectsmust include English, Maths and 1 Science (Biology, Physics, Chemistry). Comparable qualifications may be considered for example, NVQ/SVQ at Levels 2 and 3. A background of working with horses is recommended and personal fitness essential. For people who already hold the Veterinary Nurse qualification, and are listed with the Royal College of Veterinary Surgeons, a fast track/add on is possible; provided they have a minimum of 2 years post-qualification experience of working at a suitable equine practice. Consideration should be given for the possible expenses incurred to cover examination entry fees and courses. What Does an EVN Do? 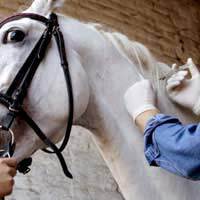 Equine Veterinary Nurses (EVNs) have to deal with all aspects of horse care. Once qualified, theymay take on more responsibility but remain under the professional supervision of vets. The student nurses complete routine jobs like mucking out and disinfecting stables, sterilising surgical instruments, feeding and leading horses. They are monitored by senior nurses and appropriately assessor-trained vets. EVNs assist vets in the preparation of drugs, are permitted to give catheter injections, intra-muscular and subcutaneous injections (with veterinary supervision of quantities). Theyalso care for in-patients, prepare and carry out laboratory work and help the vets insurgery/clinics and theatre. Good communication skills are important for giving feedback onpatients and to assist the smooth running of their teams. Teamwork is essential, particularlywhen everyone is working under pressure for example, in the diagnosis and immediate treatment of emergency cases. Specialist equine clinics have the facilities to deal with a broad range of conditions on site. A main block of stables is commonly used for general care patients so they have company without the risk of injury to each other. Isolation areas with stables will be required for infectious, suspected infectious or currently undiagnosed patients. Named members of staff, including a vet, an EVN and a student, per shift, will normally be the only people permitted to enter this area. Each of these will work according to strict isolation procedures. A separate mare and foal facility is provided to keep mares and foals together during treatment of either or both, to minimise disruption of their close bond and avoid added stress. Brood mares may stay in another area for Artificial Insemination treatment. Stallions are kept away from other horses at all times. Preparation boxes are kept empty of bedding and water, to facilitate the preparation of horses for surgery and for ease of disinfection. The operating theatre itself has a special floor-to-ceiling, anti-bacterial coating and houses the heavy-duty surgical equipment needed to manoeuvre and operate on these large patients! Nurses will prepare for, and clear up after, surgery. Following operations the EVNs monitor patients’ in specially padded recovery rooms and keep concise records of each horse. They report their findings to the duty vets and alert them to any significant changes in the patients’ condition. Work and conditions for EVNs can be physically demanding. They are required to workon a rota that covers night duty and weekends and be prepared to assist vets in a large variety of tasks. Promotional prospects are quite good and a Head Nurse can sometimes command between £23,000 and £27,000. at the moment i am 12 years old and when im older i want to own a farm with a cafe and a vets on the farm but i also like to rescue the animals in the garden and dogs and cats on the street that i find abandoned that are potentially injured but at the moment i have no clue how to treat them and i think it would be helpfull for advice for me, if somebody could comment some websites to help me. i am very good with animals andhave 6 snakes 2 guinea pigs 1 hamster 1 dog 1 cat 3 horse's and a parrot. i would apreachiate all of your help. @Becki - you could see if this is something you could do via an apprenticeship. I have also included a link via the British Horse Society here which gives you more information regarding the best training path to take. I hope this helps and good luck. I have 12 GCSEs maths,English and chemistry my grades were B,s,Biology &physics were C's, I have a background with working with horses and have good physical fitness, where do I go to find the vacancies of Equine vetinary nurse as I fel this is what I would really be interested to have as a career with a possibility of continuing training. @Jules - An equine vet specialises in the wellbeing and care of horses and may also treat and work with other animals, which they will have trained to do during their degree. It is quite a long haul to qualify, you'll need to complete a general veterinary degree (BVetMed degree) at an approved Royal College of Veterinary Surgeons (RCVS) university.You will then have an option to specialise in equine medicine once qualified. Alternatively, veterinary nursing is the supportive care of animals receiving treatment within a veterinary practice. A veterinary nurse (VN) works as a member of the veterinary team, providing expert nursing care for sick animals. Vocational qualifications include a level 3 Diplomas are offered on either a full-time basis or apprenticeship-style alongside a job in veterinary practice. You can download a link Could You Become a Veterinary Nurse via the RCVS here. I hope this helps. As Senior Instructor at an RDA Centre I am becoming further removed from the actual horses. I would like it to be all about them again, and helping to fix the things that we put wrong.